In the past couple of days, two regular readers have told me I am not blogging enough, so I finally got my act together to offer up this trip report. Lest you think life is just one big vacation for us, we do still have to cook, shop, do laundry, clean the cat boxes, go to medical appointments, and I might add, work, as that is our reason for being here. Much of what we do daily is not exactly blog-worthy. You, dear readers, only get the good stuff. Tuscany offers one spectacular view after another. I am not sure what I expected when we decided to spend the holiday weekend in Montalcino. Certainly I expected some traffic in the height of summer, maybe mosquitoes as well. We found neither. What we did find was tranquility, uncrowded restaurants, and winemakers anxious to tell us about their wines in private tastings. We prefer off-season travel; we just did not know this would actually be off-season. We had planned to go to Abruzzo, but at an Embassy auction we acquired a three-night stay at an agriturismo. Therefore, destination decided: Le Ragnaie, less than 4 kilometers outside of Montalcino in the heart of Brunello di Montalcino country. This is a delightful, peaceful spot, not far off the road but miles away in spirit. We slept 9 hours on Friday night and Saturday night thanks to the absence of 1) AMA trucks picking up trash, 2) seagulls screaming at 3:00AM, and 3) motorini. We feasted on a terrific breakfast spread every morning, a great start to a day in the country. Le Ragnaie is also a producer of organic wines, with grapes hand-picked and sorted. Guests are welcome to sample and discuss the wines in an intimate setting, which we did with out host, Augustino, and a lovely couple visiting from Sweden. We saw very few North Americans, by the way, anywhere in the area. I guess most are intent on seeing Venice, Florence and Rome, but really, two or three days out of the mainstream would do any traveler good. 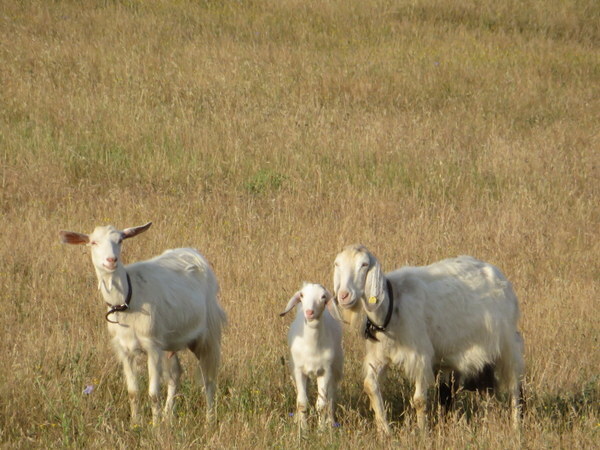 Goat family eyes us warily as we hike along their country road. Planning to eat those hearty Tuscan meals and to taste our share of Brunello, we started each day with a long walk, in the cool of the morning. As early risers we were rewarded with soft light and encountered only a few locals starting their days. From Le Ragnaie, just across the road is a country lane leading to Villa a Tolli, another agriturismo. We walked past fields of sheep, goats and a donkey, as well as vineyards. Then we turned around and hiked the 2.8 km back to breakfast. Another morning we parked in Montalcino well before the town was awake, and walked through deserted streets in search of coffee. [The only problem with an agriturismo, B&B, or small hotel is the absence of coffee when we roll out at dawn.] The morning light shined softly on golden Tuscan walls and the empty streets belied the busyness of Monday-to-come. Luckily in Piazza del Popolo we found coffee and fresh pastry at 07:00 to sustain us until our agriturismo breakfast would be ready. 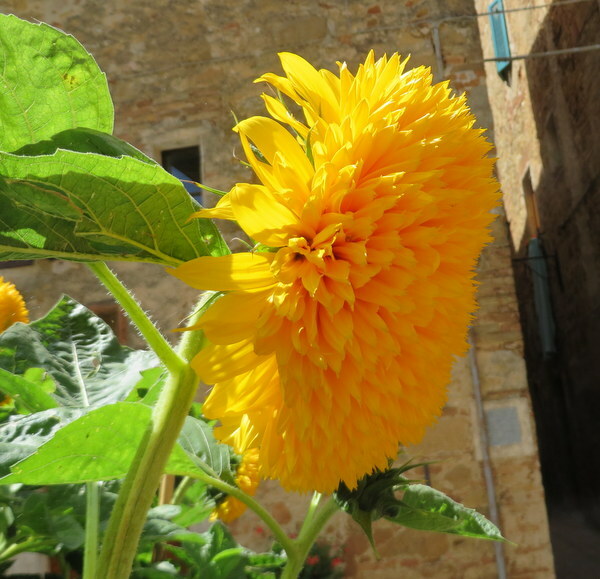 Color added by seasonal flowers really perks up the town, Pienza. With two days in the area, we spent one taking the magnificent drive to Pienza and Montepulciano. Classic Tuscan scenes unfolded: villas at the end of drives lined by Italian cypress, fields of grain and hay bales, and vast tracts of vines. In Pienza the tempting scent of pecorino wafting out of the shops enticed us to pick up some of the famed cheese, one with pepe nero and the other wrapped in olive leaves. Stop by and we’ll share. Montepulciano gave our legs a workout. We parked at the bottom of the town and worked our way up to Piazza Grande. Montepulciano makes a fine lunch stop and there are many tempting shops. Since we had the luxury of a car and did not have to worry about handling luggage, we indulged in some gift buying. Now I only have to find those things and remember to pack them when we go to the States in October. My Italian friend Eleonora told me about a wine she liked from Montalcino, a Brunello from Ventolaio. We found Ventolaio was only a bit beyond our morning walk to Villa a Tolli, so I called late Saturday afternoon to see if we could visit. In my hesitant Italian I asked and was told certainly they were open, please come! Maria Assunta welcomed us with four of her excellent wines accompanied by cheeses, bread with her own fine olive oil, and a big heart. Maria and her son Baldassare told us about their wines, property, history, and family. The entire operation on 89 hectares is run by mom, dad, and two sons. We could not have asked for a better aperitivo! We returned with the boot full of 36 bottles of wine, six of olive oil, and one excellent grappa. The Barton household will be having several dinners planned around Maria Assunta’s fine wines in the months to come. She says the 2010 is going to be one of the very best years for Brunello, so we need to stop by in January for the release. Feel free to place your orders; my handling charge is small. 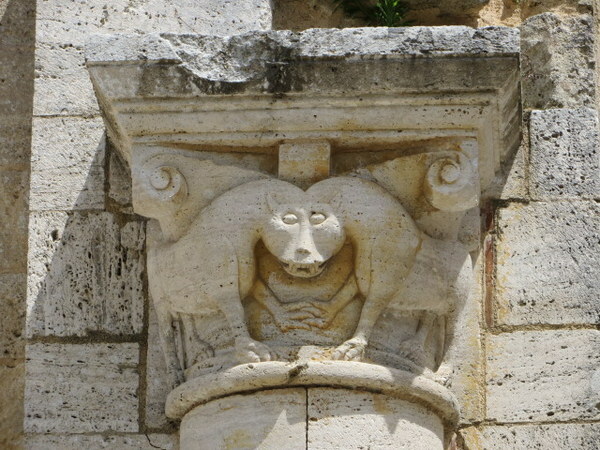 Wonderful detail on a pillar of the Abbey. Since we were driving, I had to watch my wine consumption and not have to drive too far from restaurant to lodging. (No such problem for Ric who chooses to be the navigator.) Fortunately, there are many fine restaurants in Montalcino. We are fond of Taverna Grappolo Blu. For four years I held a taste memory of their polenta vegetariana and I was not disappointed in the replay. The wine list is a heavy binder; One almost needs to order a glass of wine and an antipasto to sustain one while reading. Another favorite is Ristorante San Giorgio. While many of the restaurants in the more touristy streets and piazzas were almost devoid of patrons, the convivial, family friendly atmosphere of San Giorgio attracted many locals. It boasts a menu ranging from Tuscan favorites to fine pizza and the prices were a terrific relief from what we face in Rome. Sunday we ventured beyond Montalcino, to Locanda Sant’Antimo in Castelnuovo dell’Abate. Sunday lunch – or any lunch – under the arbor in the garden is a special experience. One can drive here in 10 minutes as we did this trip, or one can feast here after walking about two-and-a-half hours from Montalcino to the nearby abbey, as we did four years ago on our first trip to Italy. That hike was our first Italian hiking adventure and while it was fun, we decided once was enough. Still, I would recommend it to anyone who craves a little country experience that borders on orienteering. 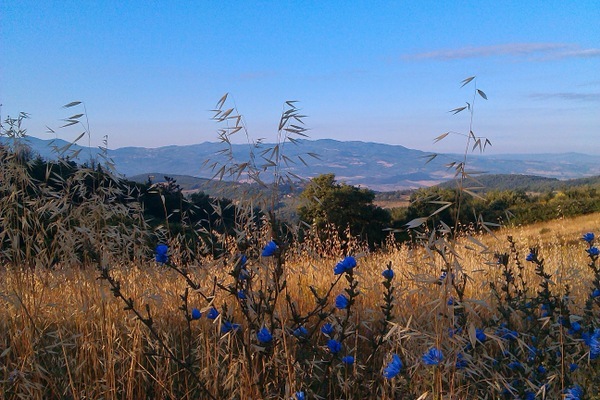 You can take a bus back to Montalcino from Castelnuovo dell’Abate avoiding a two-way hike. 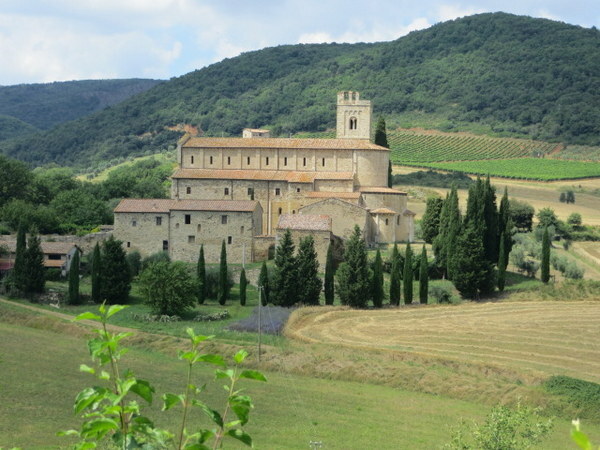 Speaking of the abbey, Abbazia Sant’Antimo is not-to-be missed. Dating to 1118, it is still an active community of monks today. We popped in at 14:45 to hear the monks chant, which they do six times each day. Much to our surprise, the community is apparently only 4 or 5 monks strong! I guess the monastic life just doesn’t attract men like it did a few hundred years ago. Rome’s weather has been great this year: not nearly as hot (yet) as the past two summers. We have hardly used the A/C and the mosquitoes have not been a problem so we have been sleeping with windows open. The downside is the noise. As much as we love Rome, escaping to the country is truly restful, even if I have to drive to get there. We took about 400 pictures, and I know I am trying to share too many, but if you are motivated to do so, click on any picture below for a slide show. Very few follow the monastic lifestyle….at least here. Yup, Taverna Grappolo Blu still has polenta vegetariana! The tapestry of the Tuscan countryside, viewed from Pienza. The cinghiale is revered..and eaten…in Tuscany. Montalcino’s bell tower in the waning light. The hill town of Montalcino, seen from the road to Pienza. The herd consisting of sheep, goats and a donkey make for strange friends. Soft morning light highlights the lane through Villa a Tolli. The old church in Villa a Tolli. Brought back some wonderful memories for us, Laurel! Another little piece of heaven on earth. Thanks for sharing! When are you coming back in October? Wow. That wine sounds just devine. I love those pictures from the Abbey. I just don’t know how you’ve managed to actually lose weight with all of the wonderful food, wine, and cheese. It’s the walking, Marcia. If we stop walking we’ll blow up like balloons! Ciao Matthew! So nice to hear from you! I wonder if I would appreciate the experience as much if I lived in the country? It’s like going to the ocean in Oregon: it’s very special when you don;t live there. I enjoyed your photos. I can understand your comments about what you do in Italy. We live in France for several months out of the year and it is amazing how many people think we are on a perpetual vacation. They can’t believe that I do the same here as I do in California. Thanks for the validation, Chloe! Some of the things we do here are even harder because we do not have a car and we walk almost everywhere. It is also a blessing and a curse to not always understand everything going on in the culture. I like to think I am confused on a hgiher level in Italy. My thot when I looked at the big Abby with only 4 – 5 was who keeps those white robes so sparkling clean! We were just saying that about YOU last night: Where has Carolyn been? Glad you are “out there” and can;t wait to see you in October! Thanks so much for this post. While I love your blog and would often like to see more, I can certainly understand why you don’t post more often. This post took me back to my visit of the Crete Senesi, the Abbey of Monte Oliveto Maggiore, and Montepulciano last April. Glorious! Hope to return in the not too distant future. I enjoyed the photos, too. Thanks Christine. I think you know well the challenges or writing versus experiencing! When I read your blog I yearn for the Cinque Terre! Laurel, Though I wish it were me, you have me mixed up with someone else. Thanks so much for the compliment anyway, I’ll take it!